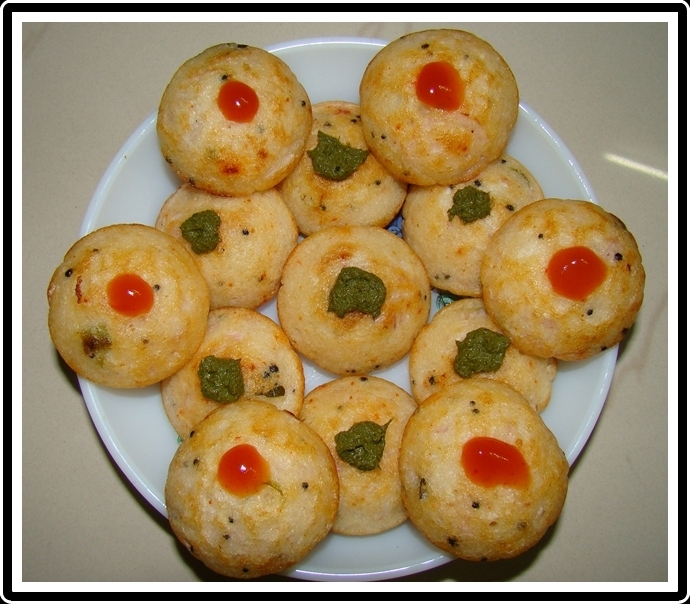 Food Gamut - New spectrum of Food: Rice Appe-- South Indian snack made from dosa/idli batter..
Rice Appe-- South Indian snack made from dosa/idli batter..
Soak rice and urad dal separately at least 5 hours. Drain and grind to a batter with a grainy texture. Transfer to a deep bowl and set aside in a warm place to ferment overnight. Heat 2 teaspoons oil in a small non stick pan. Add mustard seeds and cumin seeds to the oil and let them splutter. Add Chana dal and udad dal. Add curry leaves, onion and green chillies and sauté for 2-3 minutes. Serve hot with coconut chutney or tomato catch up or fudina daniya chatni..